Stringer/ReutersMedical staff members take part in a Ebola virus preventive drill at Ditan Hospital in Beijing, October 30, 2014. China will dispatch an elite unit from the People’s Liberation Army to help Ebola-hit Liberia, the Foreign Ministry said on Friday, responding to U.N. calls for a greater global effort to fight the deadly virus in West Africa. Washington has led the international drive to stop the spread of the disease that has killed nearly 5,000 people, sending thousands of troops and committing about $US1 billion, but Beijing has faced criticism for not doing enough. The PLA squad, which has experience from a 2002 outbreak of Severe Acute Respiratory Syndrome (SARS), will build a 100-bed treatment center in Liberia, the first such facility in the three countries most impacted by Ebola to be constructed and run by a foreign country, said Lin Songtian, director general of the ministry’s Department of African Affairs. The center will be open for operation in a month’s time, he told a briefing in Beijing. 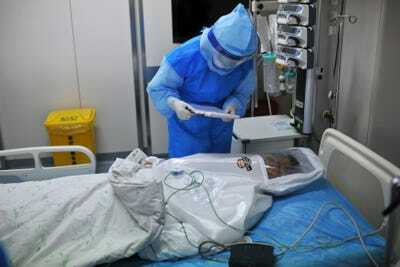 China will also dispatch 480 PLA medical staff to treat Ebola patients, he said. It’s the first time China has deployed a whole unit of epidemic prevention forces and military medical staff abroad, Lin said. China is Africa’s biggest trade partner, tapping the continent’s rich vein of resources to fuel its own economic growth over the past couple of decades. Some critics have rounded on Beijing for not helping more in Africa’s hour of need. China has so far donated 750 million yuan ($US123 million) to 13 African countries and international organisations to combat Ebola, according to the government. “China’s assistance will not stop until the Ebola epidemic is eradicated in West Africa,” Lin said. The White House this week responded to criticism that as the global superpower it was not doing enough by taking a veiled swipe at the contributions of Russia and China. “When we have a situation like this on the global scene, people aren’t wondering what the Chinese are doing to respond to it. People aren’t picking up the phone and wondering if Vladimir Putin is going to commit Russian resources to this effort,” White House Press Secretary Josh Earnest told a media briefing. China said in July that more than half its foreign aid of over $US14 billion went to Africa. In comparison, the United States spent about $US46 billion in fiscal 2015 on foreign aid programs. 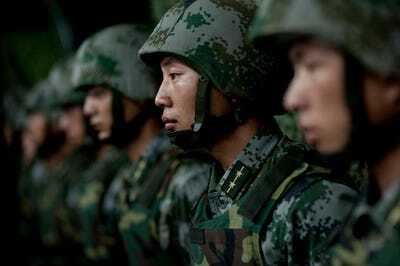 China has also dispatched hundreds of aid workers to Africa to combat Ebola including health experts and medical staff. Sihuan Pharmaceutical Holdings Group Ltd., a Chinese drug maker with military ties, has sent several thousand doses of an experimental Ebola drug to Africa and is planning clinical trials there. Lin said several thousand Chinese nationals live in Guinea, Liberia and Sierra Leone, and about a million Chinese nationals live on the African continent. U.S. and Chinese troops staged their first disaster relief exercise last November in a signal that China is increasingly eager to use its growing military muscle for humanitarian causes as it works to win international support. China dispatched a state-of-the-art hospital ship to the Philippines last year after one of the world’s biggest typhoons that killed thousands there. The United Nations has called on foreign governments to ramp up efforts to help the Ebola-hit states of Guinea, Liberia and Sierra Leone, requesting they send hundreds more medical personnel to the impoverished states to help. Foreign efforts have been complicated by public health policy issues at home. Some U.S. states have slapped mandatory quarantines on health workers returning from Ebola-hit states, while Australia this week imposed a blanket ban on visas from the three affected states. Health experts have decried the measures as draconian, and say such policies may discourage badly needed foreign doctors and nurses from volunteering to help.